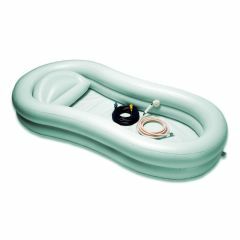 With the new and improved EZ-Bathe inflatable bathtub patients can enjoy bathing the way it's meant to be - soaking wet! The EZ-Bathe allows clients to enjoy a bath or shower without leaving their bed. The client simply rolls onto the vinyl tub, which is then inflated around them using the included wet-dry vacuum. The reinforced tub with its new streamlined design is longer and deeper. Fits most beds. The hand-held shower connects to a tap up to 25-feet away. The drain hose leading to bathtub, sink or toilet can be turned off for a long soak or left on for constant draining, allowing a shower. The drain hose and vacuum, both optional, empty the tub thoroughly. Compared to the comfort and convenience of EZ-Bathe, nothing else holds water! No parts sheet included. Drain plug missing. I thought I was ordering only the inflatable tub as I already had the wet-dry vac from a previous tub. Installing the drain plug didn't make sense until I realized there was a piece missing. I was happy to see the drain at the bottom instead of on the side where the patient was frequently lying on it. I've an electric air pump. Easy To Install. I have two sons 18 and 22 who are disabled and wheelchair users, fully dependent for care. Our bathroom is so small which makes it hard to bathe in the shower. This inflatable makes bathing much easiers. Easy To Install. Safe. Sturdy. I love this product. It isn't really perfect, but compared to other options (like sponge bathing) and other similar products, it's the best. That's why I gave it 5 stars. It worked better than I expected. The shower head is great and the bed is real sturdy. It's seems sturdy enough to be a kiddie pool. As a matter of fact, it's roomy enough to put my child in there with me for some water fun indoors. And it's deeper than I expected so I can enjoy a real good bubblebath soak. The drainage with the hose is slow and needs improvement. By the time the water drains, the patient can get cold. But the water vaccuum helps with that and makes the whole product all the more worth it's weight in gold. The pillow could be made a little smaller or conformed to fit a little better, but deflating it some can work. I wish I would have bought this product sooner. If it is difficult to use a regular bath or shower, this product is an excellent alternative. Easy To Install. Sturdy. Functional. Safe. A little heavy. Connecting drainage hose. Vacuum should have longei. flexible hosei. This tub is great for giving my husband a shower in the bed. It is easy to inflate with the shop vac included. This vacuum did stop working the second time I used it to vacuum out the water, but the company replaced it right away. I really enjoy giving my husband a shower again, even washing his hair. It is easy to use. Surely beats bed baths 100 times over. I was afraid my husband wouldn't like it, but he enjoys it. Excellent idea for the disabled. Sturdy. Functional. Safe. Easy To Install. Lightweight. Give the disabled a way to take a clean bath without the hassle of getting into the bathroom. how can i get a replacement plug for the drain? The widith on the inflatable tub, is that in inside measurement or from the outside when inflated? how do I fill it and empty the water? What do I use to inflate it? The tub comes with a small wet/dry vac which can be used to inflate. I use a 14 gal wet/dry vac to inflate the tub and to empty the tub when done. It is much easier than using the hose provided with the tub. Do I need to put the tub near a sink or how do get the water out of the tub? can the showerhead with the on and off switch be ordered without the tub? Can we use this for different patients and how do you clean the tub for infection control purposes. Unfortunately, any disinfectants you would need to use for multiple patients, would be very corrosive to the tub. How can I order the Inflatable TUB only? Can I order an extra Shower head(Spray)? Why can't I get it shipped to Canada, or rather 'how' can I get it shipped to Canada if I am willing to pay for the shipping charges. thank you. does it come with a pump ? Will the pump require 110 V or can work outside US where we have 220 V electricity ?